The Russian naval expansion that would eventually help lead to the Russo-Japanese War can be traced to the firing of German Chancellor Otto von Bismarck by the young Kaiser Wilhelm II in early 1890. A parting of the ways was probably inevitable as soon as Wilhelm took the crown, but part of the immediate conflict involved Bismarck’s showing Wilhelm a letter from Russian Tsar Alexander III describing the young monarch as “a badly brought-up boy.” Between the personal animosity that resulted and Bismarck’s apparently permanent departure from office, the chances of a renewed alliance between Germany and Russia now looked remote at best. Russia would need new friends. The Russians quickly found them. France eagerly embraced a Russian alliance, with a series of agreements beginning in 1891 that led to a full, formal military alliance by 1894. The earliest deals struck between the Republic and the Empire involved large-scale French financial aid to assist in military-related projects, like railroads, and the buildup of the Russian fleet. While the French intended that new fleet to confront Germany, it would actually be used to first to intimidate the Japanese without much success, and then to fight them with even less success. 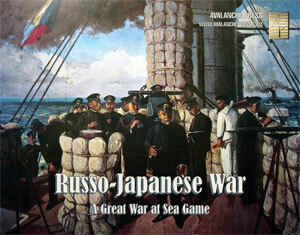 These are the battles depicted in Great War at Sea: Russo-Japanese War, and now we’ll start a look at the battleships deployed by the Imperial Russian Navy in the war and in the game. Russia had built a series of poorly-designed battleships in the 1880’s, most of them for the Black Sea Fleet. None would initially be sent to the Pacific Squadron, but four of them made the round-the-world journey with the Baltic Fleet to reinforce the Far East during the Russo-Japanese War. Imperator Alexander II and her sister Imperator Nikolai I were classed as “barbette ships,” as they carried their main armament of two 12-inch guns in barbettes rather than turrets. The barbette mount featured a fixed armored shield protecting a rotating gun mount. This limited the guns’ field of fire, but saved a great deal of weight since the machinery of the day could not easily move both the heavy guns and the heavy armor of a true turret – before the development of hardened armor in the 1890’s by Harvey and then Krupp, warships sported much thicker compound steel to defeat the new armor-piercing shot than would be needed once more effective plate became available. With their lack of speed, out-dated protection and weak and poorly-arranged armament, the pair should have been scrapped years before the Russo-Japanese War, but instead were refitted with Nikolai I receiving a major reconstruction in a French yard between 1902 and 1904 which added little to her fighting power. The Japanese captured Nikolai I at the Battle of Tsushima and repeated the Russian insanity by refitting her for their own fleet; Alexander II did not make the voyage to the Pacific. The turret ship Navarin, laid down in 1889, also sported compound-steel armor but was comparatively a much better fighting ship than Alexander II – which still rendered her very much out of date by 1905. She had a very low freeboard and like similar ships of her era resembled a large sea-going monitor more than the pre-dreadnought battleships that followed her. Navarin carried four 12-inch guns in a pair of turrets, and a secondary battery of eight 6-inch guns in an armored casemate similar to that of a broadside ironclad. Navarin had served on the China station during the Boxer Rebellion, but returned home in 1902 to commence a major refit, which was still under way when the Russo-Japanese War broke out in February 1904. Dispatched with the Second Pacific Squadron, she made the voyage around the world and met the Japanese at Tsushima. She fought well, absorbing a huge amount of punishment before striking at least one mine and sinking. The next ship, Sissoi Veliki, began as a barbette ship with three 12-inch guns on the same hull as Imperator Alexander II. When the Russian admirals expressed unhappiness at the reduction in firepower from Navarin’s four heavy guns, the design team increased the main armament to four guns, still in barbettes. During construction, the architects apparently began to receive French advice and assistance, and swapped out the barbette mounts for two French-designed turrets and replaced the obsolescent Russian-made medium-caliber guns with more modern French models. The resulting ship took extra years to build and was thoroughly unsatisfactory when commissioned. She had been armored with nickel-steel, much more effective than the compound armor carried by Navarin, but despite her long building period construction had been rushed at many points in an effort to make up for time lost in the repeated re-designs. Steering gear had to be cannibalized from the new battleship Poltava under construction at the same yard (New Admiralty, a private shipyard in St. Petersburg) and only on her maiden voyage to the Mediterranean did the crew discover that the steering compartment had been built without ventilation. Electrical systems failed repeatedly, hull plates had not been fully welded, and during the ship’s second gunnery exercise her rear turret exploded, killing 22 sailors and injuring nine more. Sissoi Veliki limped to Toulon for lengthy repairs, where the French dockyard found massive construction flaws. The Russian architects sent to inspect her declared the ship unfit for service; their superiors overruled them and Sissoi Veliki was ordered to the Far East. After three years at Port Arthur the needed repairs outstripped what could be done locally, and she returned to St. Petersburg for refitting. She was still under repair when ordered to join the Second Pacific Squadron heading out on its round-the-world voyage; once again the architects declared her unfit to sail and once again they were overruled. Sissoi Veliki had made it Port Arthur once before and therefore she could do it again. The ship suffered an even dozen boiler failures on the voyage out plus four of her steering gear. Battered by Japanese gunfire in the opening stages of the Battle of Tsushima, Sissoi Veliki attempted to reach Vladivostok but suffered a torpedo hit and began to sink. Her captain surrendered to save his crew, and the Japanese tried to tow the ship away but she capsized and sank. Flush with francs, the Russians immediately set about squandering their new-found wealth. In 1892 the Imperial Navy laid down a pair of coast-defense ships intended to match similar Swedish vessels, adding a third, somewhat improved model to the class in 1894. The Admiral Ushakov class, designed for 4,126 tons, came in severely overweight at 4,971 tons’ displacement. The first two ships carried four low-velocity 10-inch guns as their main armament, with a variety of light guns and four torpedo tubes. They were very slow and had a low freeboard, but were the first Russian heavy ships to sport face-hardened armor. The third ship, General Admiral Graf Apraksin, had only three 10-inch guns in an attempt to correct the weight problems of her two sisters. Initially left out of the reinforcement fleet headed to the Far East in 1905, they were added after the main body had already left – the opportunities for graft were just too great for any warships to be left out of the frenzy of re-fitting at any cost. One was sunk at Tsushima – whether by Japanese action or her own crew remains unclear – and the other two surrendered to the Japanese. Both were refitted by the Japanese and served under the Rising Sun in the First World War.